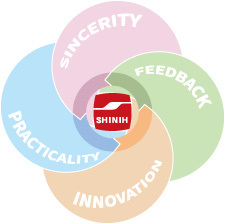 COMPANY - SHINIH ENTERPRISE CO., LTD.
Like a toddler learning how to walk, Shinih has progressed with great care through the experiences of the last forty years to become one of the largest non-woven manufacturers in Southeast Asia. Even one of the top Non-Woven companies in the world, Invista, recognizes Shinih's achievements and chose us as one of its global strategic partners. Copyright © 2008 SHINIH ENTERPRISE CO., LTD.